Stewart Regan and his wife had planned the holiday for some time. It was to be a weekend in Loch Inver, including long walks in the Highlands. It should also have offered an escape. The weekend happened to be the same one, in July 2012, that clubs voted for Rangers to play the following season in the bottom tier of Scottish football. As the chief executive of the Scottish Football Association, Regan had been in the eye of the storm ever since Rangers went into administration six months earlier, and this was the nadir. The couple had photographers and cameramen outside their home, but even up north they could not escape the attention. In a pub, Regan felt uncomfortable and scrutinised. "It was awful, my wife was really uncomfortable, and we just packed the car up and drove back home," he recalls. "Neither of us said a word in the car, it was silence. When the radio was on there was just talk of various issues and actions that were going on in Scottish football and we just turned it off. It was a three- or four-hour drive and it was a pretty horrible weekend." The SFA's first approach to Regan came through a headhunting firm who had been tasked with identifying a successor to Gordon Smith. Regan had spent four years as chief executive of Yorkshire County Cricket Club but knew elements of Scottish football through his involvement with the licensed trade and sponsorship deals. His initial reaction was to decline but then he was persuaded to meet the SFA board, who offered him the vision and the opportunity to modernise the way the game is governed in Scotland. "I said 'no'," Regan admits. "At the time, I didn't feel that I wanted to relocate up to Scotland. "But I had a chat with them, they talked about the [Henry] McLeish report [into the future of the Scottish game] and the role I would play in implementing that. "I went away, discussed it with my wife and thought that I would give it a go." Before taking up the role, in October 2010, Regan and his wife had dinner with Neil Doncaster, the chief executive of the then Scottish Premier League, and his wife. The two men's paths had crossed before, when Regan was managing director of the Football League Championship and Doncaster was chief executive for Norwich City. They spoke about Scottish football and what Regan might encounter in the job, but neither could have known the extent of what lay in wait for them. Even after his first hour in the job, Regan found himself dealing with an awkward and high-profile situation. "I didn't even have time to unpack my bag," he says. "I was asked by the president if I would sit down with the disciplinary team, the refereeing department, and review some footage regarding a potential disciplinary matter involving Allan McGregor, who was the Rangers goalkeeper at the time and who had allegedly kicked out at Chris Maguire of Aberdeen. "It was in the rules that it was the chief exec who should make the final decision in the event of the organisation not coming to a conclusion. So I was asked to make a call on it and I was of a mind that Allan McGregor had kicked out at Chris Maguire. "I had Martin Bain, who was the chief exec of Rangers, on the phone not long after that expressing his dissatisfaction, and little did I know that I had Allan McGregor with me on the plane on the Wednesday when we flew out for Scotland v Czech Republic. That was an interesting few days." Weeks later, Regan had to deal with a referees' strike and then an internal disciplinary matter with Hugh Dallas that led to the latter's departure as the head of referee development. There were other smaller dramas to contend with, as well as driving through the recommendations of the McLeish report, which led to full-scale reform of the organisation following an annual general meeting vote in June 2011. "It was probably easier for an outsider to do than someone who was seen to come from within Scottish football," he says. "It's really difficult when you're seen to have one favoured club or one favoured part of the game. I had none of that." In February 2012, Rangers Football Club plc entered administration. That was the starting point for a frenzied period, with Regan central to many of the decisions made at the time. By the summer, with the company having entered liquidation and the business and assets having been bought by a consortium led by Charles Green, negotiations began between those organisations, the SFA, the SPL and the Scottish Football League. That led to a five-way agreement that covered all of the potential issues that might arise as Green's company took over Rangers' SFA membership. It was a fraught time, with the governing bodies under severe pressure from both sides - Rangers fans who felt their club was being harshly treated and fans of other club who felt more punishment was required. "It was really tough for myself and my family," Regan says. "I had a number of instances where I was abused in the streets and bars, I had difficult situations with various threats being made and I even had the counter-terrorism unit visit the office giving advice on how we handle mail. "I was a big fan - I still am - of social media. There was a period where my own Twitter account almost went into meltdown and there was abuse levelled at me from both sides of Glasgow. "There's never been a point when I've felt, 'right that's it, enough's enough'. I tried to keep a lot of the challenges away from my wife and family. "I would argue that there is a greater degree of transparency [at the SFA]. There are always going to be times when documents are signed under confidentiality [arrangements], it's the same in any business. [The five-way agreement] was one of those. "One of the first drafts was printed in a Sunday newspaper in Scotland, so it's not as if it's never been out there. It's one of those documents that has become an urban legend. People speculate and come up with conspiracies as to how it might have evolved and been used. "You make a judgement call given the facts and situation that you're faced with. 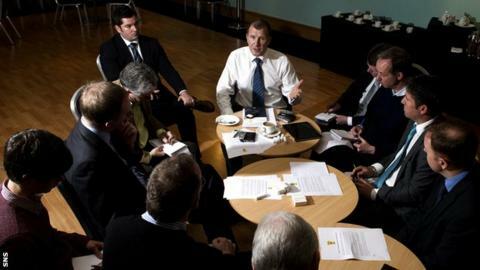 We had to get a solution that was in the best interests of Scottish football and that's where we got to." Scotland missing out on qualification for Euro 2016 continues to frustrate Regan, as well as national coach Gordon Strachan, the players and the fans. The Scots were in a difficult group, but only drew up short when they dropped points away to Georgia as the campaign drew towards its conclusion. After a period of consideration, Strachan decided to stay on as manager. Regan believes that was the right decision because, despite the outcome, Scotland made progress in his view. "I don't think you can simply say it's failure and draw a line under it," he says. "Gordon galvanised a squad that was drifting before he took over, that wasn't together. He's got them playing with more flair, more passion and they were certainly more difficult to beat. "When you see the reaction from the fans in Faro after the Gibraltar game [the 6-0 win at the end of the Euro 2016 qualifiers], you could see what Gordon's performances had meant to them; 10,000 fans were there at the end, giving him a standing ovation. We'd seen enough to recognise that he was the man to lead us forward." Regan grew up a Sunderland fan and can recall boyhood trips to Roker Park, standing "on your tiptoes peering through the shoulders of the people in front of you - you could smell the cigarette smoke and the alcohol". His role in football is less emotional now. There remains a corporate detachment to him that doesn't allow his personality to slip through. He wouldn't change it though. "I don't think I would have said 'no' [given the choice over again]," he adds. "I love the country - I've probably seen more of Scotland than most Scots have - and hopefully we can get Scotland to qualify again in the not too distant future."